About half done with the inventory and so far just a couple of minor issues with the aluminum plates in box 6. I have asked this question of Mark at Breeze and still waiting for an answer but maybe others could help? I am installing the Breeze roll bars and plan to paint them the same color as the stripe. Prior to taking the body off, I'd like to go ahead and fab up the roll bars, apply the primer and get that done. Am I correct in assuming the body as it comes attached from FFR is correctly positioned, so if I enlarged the holes and fit the roll bars first, I'd be OK? Am I correct in assuming the body as it comes attached from FFR is correctly positioned, so if I enlarged the holes and fit the roll bars first, I'd be OK? I personally wouldn't assume that. You'll find the aluminum pieces may not end up in exactly the same locations, plus the bulb seal isn't installed yet. So the body very likely will end up positioned a little differently than shipped. The difference may or may not be important as the roll bar holes are typically a little oversized and the difference covered with the grommets and trim rings. But I personally wouldn't chance it. Mainly in an effort to practice loading photos, attached is my reclaiming system for the packing paper. I'll use this for masking purposes. The paper was too good to throw away! As I was doing the inventory, which is finished, I kept up with the pieces that need to be powdercoated. I have a homemade deal that works well on smaller pieces. Last edited by Jacob; 07-13-2017 at 09:19 PM. clever way to save the paper. There sure is a lot of it! I saved some and use it to make templates when making pieces of heat/sound shield for the panels. Decided to go ahead and start on the AL panels since various parts are still on B.O., drilling so many holes it becomes much like painting...drift off into senselessness! Plan is to undercoat trunk and fender panels, lizard skin on the inside and the panels that are visible (thinking about basecoat / clearcoat silver)...not sure yet? Also installed the Russ Thompson trunk box...will post some pics the next time. You may want to also look at UPOL's Raptor Bed Liner for your undercoating needs. It's super easy to use, is a two-part catalyst activated polyurethane system that comes in all sorts of colors including black. You mix the stuff in the can that it was shipped in and then attach the spray gun that comes with the kit. It really looks professional and you can vary the texture with the air pressure and distance. applied bedliner to fenderwell and underside panels. Upper A arms look correct. That is strange about the footbox front panel not lining up. I ended up covering that hole with a fill plate anyways and then drilling a smaller hole in the middle of the fill plate that my brake and hydraulic clutch hoses to the reservoir come through. If you are not using a cable clutch the alignment may not be critical. Maybe check with factory five? What brakes are you using? I did the wilwoods and they come drop shipped directly from the manufacturer in their own box. Planned on a clutch cable, i'll talk to them tomorrow. On the panel where its listed on the sheet, it notes a June 2016 revision, so maybe my frame setup and the panel may be disconnected? I'm sure they'll make it right. I think the brakes will be dropped shipped, just not sure when? thanks! the old footbox front was sent in error, the correct replacement is on the way ....simple problem, quick solution! 1. when put in place there was about an 1/8" gap between the pumpkin and the mounting flange, so I put some washers to fill the gap. 2. seems to me the rear two bolts could stand to be about 1/2" longer, didn't feel comfortable torquing those two bolts to 100 lbs since its aluminum, afraid of stripping the threads so I did 80 lbs? Have others had any issues? Last edited by Jacob; 07-27-2017 at 03:29 PM. Congrat's on getting the center section installed! I did mine myself as well. Much like you lifting it through the open top plus from the bottom. I've heard of others requiring spacers as well. Mine didn't. Not sure what changed. The frame or the Ford center section. Whatever, adding the spacers should be fine. Regarding the rear mounting bolts (M14-2.0 x 100MM FLANGE HEAD BOLT) mine engage the aluminum ears all but about the last 1/4-inch. That's over 1-1/2 inches of thread engagement. You're not going to strip those at 100 ft-lbs. 80 ft/lbs is probably OK. I don't think they're going anywhere. But you can take them to the recommend 100 ft/lbs IMO. No issue with mine doing that. Got the brake calipers on, finished up the IRS (a challenge for sure) and got the rear sway bar in. I'll have to torque the rear bearing nuts later, but do have a question for those who may know...are the front and rear wheel bearings "packed" with bearing grease? Not sure if these are considered sealed bearings? If this IRS performs like it looks, it should be impressive! Last edited by Jacob; 07-27-2017 at 03:33 PM. I called FFR with the same question and they said the wheel ends were Pre packed. Been busy spraying ceramic insulation on the aluminum panels. Found some stuff on amazon that I thought I would try, its about half the price of lizardskin. Not sure it was worth all the effort but planned on using hushmat too. Sprayed all panels that involve the interior about 4 times. Masked off those areas that will need to mate up with another panel...tried to do a somewhat scientific comparison of heat insulating before and after and the best I can figure out it reduced the heat by about 20%. Used a digital thermometer and got about 157 degrees from my heat gun before and got about 122 degrees after, so the heat gun may be too severe of a test. Sprayed it on with a cheap sprayer from HF ($14)...made a mess but sprayed on a good pattern. All in all not too bad. Last edited by Jacob; 07-27-2017 at 03:40 PM. Finally got the correct brackets for the rear brakes and fired up the powder coating operation. The system works pretty good for less than $100 investment. Next up is to start running the brake lines. Pedal assembly is installed. Last edited by Jacob; 07-27-2017 at 04:39 PM. 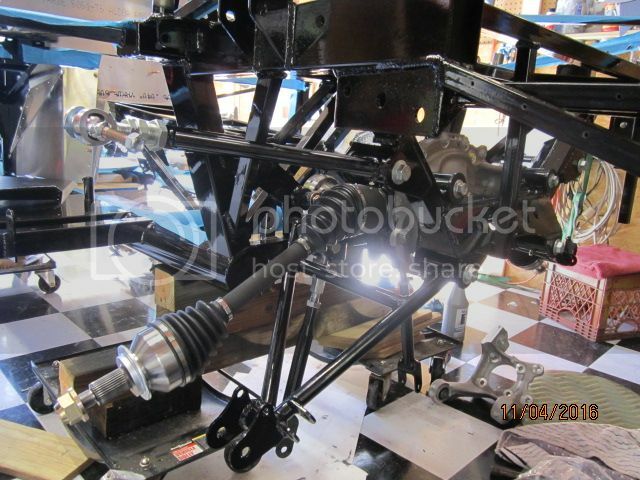 Progress update, installed brake lines, brake master cylinders, accelerator assembly. Probably will re do the front, not liking how the loop protrudes into the engine bay area..
Last edited by Jacob; 07-27-2017 at 03:47 PM. looking good. I had a similar loop on the brake line I was unhappy with. When I went to install the power steering reservoir the lines ran perfectly down through the loop. Almost looks as if I planned it that way. Pure luck though. haha Maybe that loop could work out for you. Luck or smarts? Either way you got the results! Last edited by Jacob; 07-27-2017 at 03:59 PM. Opinions differ as to whether this makes a difference or not, I personally think it does, so I installed some heat shields on the footboxes. Plus I like how they look. Powdercoated 2x with metallic silver on the heat facing panels. Last edited by Jacob; 07-27-2017 at 03:57 PM. A little more progress over the past couple of weeks. Got the FF Metals battery box installed. This is a well put together item, well engineered and extremely responsive customer service. Could have installed in about 30 mins but I spent more time powdercoating it 3x to help against any potential corrosion. The battery box fits in between the IRS like it was meant to be there! Then I sorta temporarily mounted the heater and wiper motor. Almost mounted the heater box too far to the left (facing forward). Had alot more room so the heater could have gone farther toward the driver side. This forced the wiper motor almost too far to the left, but it worked out. Last edited by Jacob; 07-27-2017 at 04:47 PM. more progress being made, pretty well finished insulating the cockpit and decided to build a cubby behind the seats since the heater will prevent a glove box from being used. I wanted the cubby space to allow for full use of the trunk area if needed so I fabbed up a sheet of aluminum that is on a piano hinge and uses magnets to hold in place in the upright position, then if the trunk space is needed it can be folded over flat over the battery box. Whether it was worth the effort??? The idea is that this panel can be folded flat if more room is needed or can be held upright with the magnets. I also installed an LED light with a toggle so it will light up this area. Last edited by Jacob; 07-27-2017 at 04:57 PM. That's a cool feature! Nice job. Last edited by Jacob; 07-27-2017 at 04:15 PM. I like the creative use of the cubby and trunk space! That is a pretty slick solution, and it turned out great. Build is coming along nicely. Keep up the good work. It may appear I've been doing nothing, but really I have. Been having fits dealing with brake fluid issues. After alot of effort I finally found I had a defective brake fluid reservoir, it had a pinhole spot that wasn't fully welded and it was leaking and after a long effort finally found it. Bleeding the brakes had to be put on hold since my trusty assistant had appendicitis. Plus a couple of weeks in Hawaii slowed me down. All that said, I plan to get back to work tomorrow! Anyone see any reasons why I couldn't mount this air gate in the locations I've chosen? 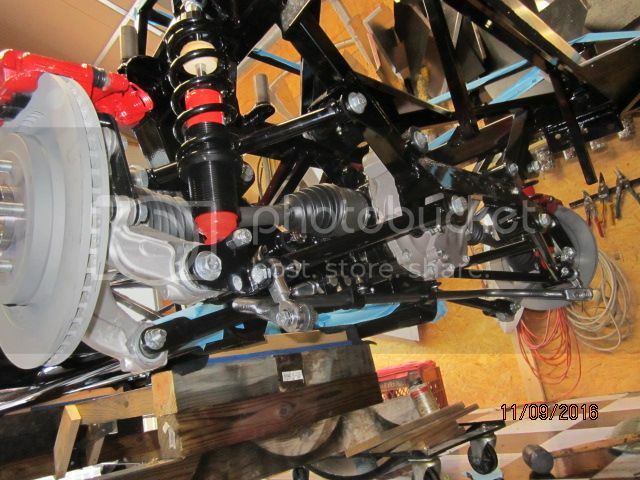 On the driver side it would come in just above the header area and on the passenger side on top of the footbox. I found these aluminum gates on Amazon and like them. There is about 3/4 inch on each side so it would seem easy to attach the 3" hose. Trying to think of what could possibly interfere and can't come up with a reason why they wouldn't work in these locations...all input appreciated! Last edited by Jacob; 07-27-2017 at 04:05 PM. They look well made and functional. Have you considered opening and closing them. I know at my age, I might not be able to bend enough to operate them. Last edited by Railroad; 04-03-2017 at 08:27 PM. They look well make and functional. Have you considered opening and closing them. I know at my age, I might not be able to bend enough to operate them. I am assuming they'll be open most of the time, but they'll be pretty easy to reach and if all else fails I'll get my grandson to crawl in and open / close. Not sure if I am describing this the best I can? I am trial fitting the dash and my question is whether the top of the dash should sit flush with the curvature of the top rail of the steel frame work? If I put the aluminum flush with it, the dash sits too high for the far left gauge (this case its the tach), so to be able to thread the backing plate on the tach the dash has to drop down about 1/2 inch. I am thinking that as long as the dash sits at or below the steel framework I'm OK.
Could you have done a single brake fluid reservoirs and just "T'd" the lines? I was thinking about doing that. Yes, but for what ever reason I think one tiny reservoir looks cheap? No logic to this, one would work well. Just thought 2 looked better. Been busy mocking up the Russ Thompson turn signal setup, dash, console and wire harness routing. This is how I intend to mount the fuse panel. Realize the FFR has it under the steering / brake cylinder setup but I just saw this as a better way to go. This allows easy access to the panel and this also allows routing the rear harness and allows easier in / out of the dash area. This part of the console will be removable. The fuel lines will run on the passenger side (top) and the electrical will run on the driver side. Last edited by Jacob; 07-27-2017 at 04:27 PM. Your RT turn signal assembly shouldn't stick out that far. It has a mounting bracket that attaches to an angled bracket on the 2x2 tube under the dash. Push it down to that location, then adjust the steering column to be in the right location for the steering wheel. This isn't the best picture (early in the wiring process of #8674) but in the LH side you can see the mounting bracket and location. The actual turn signal lever and assembly is removed in this pic, but the tube and mounting are as supplied from RT. Personally, I'd be a little concerned about that fuse panel location. Granted I guess it makes the rear harness routing a little simpler. But IMO it's not a big deal to route through the upper corner of the DS footbox as shown. What I'd be more concerned about is the front harness. The two legs (LH and RH lighting) are just long enough as supplied. With it further away, I'm betting you're going to find them too short. Something to check. I agree the stock location of the fuse panel looks a little hard to get to. But for the relatively few times you need to get to it once the car is operational, I would question the value of moving it. Once everything is sorted, you will go months/years without ever needing to even look at it. If you do, popping in/out a fuse or relay is quick and easy. Your choice though. Make it your way. There has been quite a few threads discussion the merits (or not) of fuel and brake lines inside the transmission tunnel. Consensus of most is not the best location due to the spinning driveshaft. If you're set on doing that, at least make a driveshaft loop mandatory for your build. Last edited by edwardb; 04-17-2017 at 06:25 AM. Thanks for your feedback Edwardb, I appreciate your thoughts. I ran the front harness first and the wires terminate right at the front of the frame rails, with the connectors that I plan to use on the front I think I will be OK. I do plan on using the driveshaft loop too. Russ asked me to give him a call and he can guide me thru what I need to do to get the signal housing closer to the dash. Also, I have properly adjusted the Russ Thompson turn signal housing and am happy with where it sits now. Pics to follow. Last edited by Jacob; 04-23-2017 at 12:39 PM.